GERMANICUS (a.k.a. Germanicus Iulius Caesar) was regarded by many Romans as a hero in the mould of Alexander the Great. His untimely death, in suspicious circumstances, ended the possibility of a return to a more open republic and ambitions for the outright conquest of Germania Magna (Germany and The Netherlands). This, the first modern biography of Germanicus Caesar, is in parts a growing-up story, a history of war, a tale of political intrigue and a murder mystery. It is a natural sequel to the author's acclaimed book, EAGER FOR GLORY, which, for the first time, discussed the life of Germanicus' birth father, Nero Claudius Drusus.Born in 16 BC, Germanicus grew up to be a skilled diplomat and a bold general, but also a formidable courtroom advocate, poet and playwright. Marked out to be a successor to Augustus, he married Agrippina, the first emperor's granddaughter by whom he fathered nine children, including the future Emperor Caligula. His reputation and popularity were immense. He put down a mutiny of the Rhine legions, was responsible for avenging Rome's humiliating defeat at the Battle of Teutoburg Forest through victory at Idistaviso (AD 16), and the recovery of two of the three lost legionary eagle standards. Recognizing his achievements, the Emperor Tiberius - his adoptive father - granted him a full triumph, but refused to let him complete the reconquest of Germania, sending him instead to command the provinces in the East. Did Tiberius feel jealous and threatened? Germanicus' good fortune waned when he fell out with one of Tiberius' gubernatorial appointees, the arrogant patrician Calpurnius Piso. 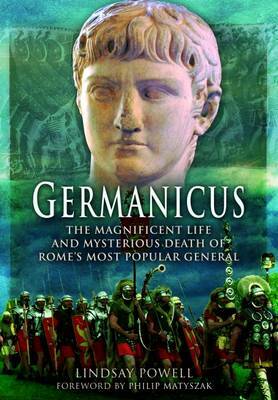 Germanicus' death in Syria under mysterious circumstances, aged 34, brought great outpourings of public grief and anger, with many suspecting murder on the orders of Tiberius. As Romans demanded justice Piso was put on trial, but he committed suicide - or was he murdered? - before the senate could reach a verdict.In this highly readable, fast paced account, historical detective Lindsay Powell details Germanicus' campaigns and battles in Illyricum and Germania; tracks him on his epic tour of the Eastern Mediterranean to Armenia and down the Nile; evaluates the possible causes of his death; and reports on the cruel fate his wife Agrippina and their children suffered at the hands of Praetorian Guard commander, and Tiberius' infamous deputy, Aelius Seianus.